Well, it has been another incredible year, jam-packed with new adventures, discoveries, and photos! It's hard to pick favourites from it all but here are my personal top 16 from 2016. Do you have a favourite image? Let me know in the comments below! A huge thanks goes out to the amazing groups and individuals that I've worked with this past year and to all those who have supported my work. It wouldn't be the same with out you! For those who might be interested, prints of most these images are available in my online store as well. Here's to a happy, healthy, and wild 2017! TJ. 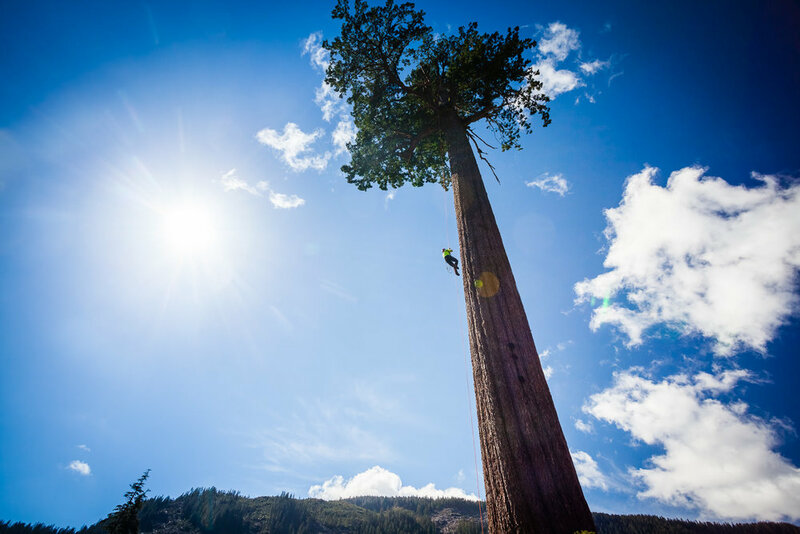 A tree climber makes his way up Big Lonely Doug, Canada's second largest Douglas-fir tree near Port Renfrew. Climbing this tree for a second time was something I never thought we'd get the chance to do but it was just as amazing an experience as the first time. It's hard to convey just how small you feel in comparison to this gentle giant but hopefully this photo does it some justice. You can see a drone video of the climb here. Canon 5D MK2 | 17-40 f/4L lens | 1/200sec | f/9.0 | ISO 400. A giant rainbow arcs across the ancient forests of Edinburgh Mountain near Port Renfrew. I've never seen a rainbow so intense or that hugged the land so tightly. As new roads and clearcuts continue to threaten the largest remaining intact old-growth forest here on southern Vancouver Island, I couldn't help but think that the mountain was happy to see us there, working to protect its forest friends. Canon 5D MK2 | 70-200 f/4L lens | 1/200sec | f/8.0 | ISO 200. The little bonsai tree growing out of sunken log at Fairy Lake must be one of the most recognizable and photographed trees on Vancouver Island. That only makes for a fun challenge though, to see how you might capture it in new and unique ways. Since the lake is connected to the nearby San Juan River, water levels can rise dramatically during periods of heavy rain. When they did just this fall, it left only part of the tree poking through the lake's surface. At times, the entire tree can become submerged. How it lives through all of this I am not quite sure, but I'm sure happy that it does. Canon 5D MK2 | 70-200 f/4L IS lens | 1/4 sec | f/6.3 | ISO 200. I love to watch the sunrise. It's a great excuse to get out of bed early and it's wonderful to have the world to yourself, if only for a little while. Of course, it's often beautiful too, like this fiery morning sky reflected in the San Juan River estuary near Port Renfrew. Canon 5D MK2 | 17-40 f/4L lens | 1/100 sec | f/5.6 | ISO 1600. My heart normally pulls me deep into the woods but over a weekend this past summer, some friends and I headed for the hills instead. It was refreshing (minus the mosquitoes) to get up high and explore an open landscape with sweeping panoramic vistas. The mountain we climbed was 50-40 Peak, located about 45 minutes outside of Port Alberni, and this was the view from near the summit looking towards Cobalt Lake (where we camped) and Triple Peak in the far background. Canon 5D MK2 | 24-70 f/4L IS lens | 1/800 sec | f/10 | ISO 400. The evergreen forests of coastal BC are dominated by a million shades of green and brown, so the autumn yellows of this vine maple (Acer circinatum) in the old-growth forests around Echo Lake appeared as though someone had splashed brightly coloured paint across the canvass of the woods. I love the way the tree's branches flow and curve so gracefully as well. Nature is the world's greatest artist! Canon 5D MK2 | 24-70 f/4L IS lens | 1/125 sec | f/5.0 | ISO 1600. A Pygmy Owl sits perched on the branch of a maple tree next to the San Juan Spruce in Port Renfrew. Despite its cute looks and being about as small as a mini football, you can still see the feathers and flesh from a bird it must have been feeding on. The Vancouver Island Pygmy Owl subspecies is distinct and associated with older forests, and sadly, is on the decline. There may only be 500 breeding pairs left and old-growth logging is considered to be a major threat. I managed to get a single shot this little guy before he decided to fly off into the woods to carry on with his day. Canon 5D MK2 | 70-200 f/4L IS lens | 1/400 sec | f/4 | ISO 3200. I feel most alive when alone in the woods. Your senses awaken and your intuition becomes your guiding voice. While wandering through a remote patch of old-growth forest in the Klanawa Valley between Bamfield and Nitinat Lake, I heard the sounds of twigs snapping up ahead. Eyes wide and hairs on end, awaiting to determine nature the sound, a large bull elk appeared along with a group of 4 or 5 females. Relieved (slightly), it was beautiful to see them up close as a guest in their home. As quietly as they appeared they slipped away back into the woods. As I fruitlessly tried to follow their path, I stumbled upon this incredible trio of Sitka spruce trees. You just never know what amazing experience may await around the next corner out there in the woods. Canon 5D MK2 | 24-70 f/4L IS | 0.6 sec | f/10 | ISO 400. The old-growth coastal temperate rainforests of British Columbia are some of the most dense and impenetrable, yet beautiful, landscapes on Earth. Life sprouts from every available surface while debris from fallen trees litters the forest floor like a giant game of pick-up-sticks. Capturing this complex environment in a single image often presents a challenge as it ends up looking too busy or confused. On a cool winter day this year though in the Walbran Valley, the fog and light came together to illuminate this ancient world in just the right way. Canon 5D MK2 | 24-70 f/4L IS | 1/320 sec | F/5.0 | ISO 800. The San Juan River estuary is one of my very favourite places on Vancouver Island. It's home to an amazing array of wildlife including elk, deer, cougars, bears, wolves, countless birds, and much, much more. It's in a constant flux as well, ever changing with the rise and fall of the tides. Here, mist washes over the meadow during a chilly autumn sunrise. Canon 5D MK2 | 70-200 f/4L IS lens | 1/20 sec | f/8 | ISO 200. UBC researcher Vincent Hanlon provides scale from the forest floor to the towering trunks of two giant Sitka spruce trees in the Randy Stoltmann Grove in the Carmanah Valley. The group of researchers secured the help of expert tree climbers to assist them with a study on tree genetics in the valley which involved collecting samples of young needles from the tops of over 20 trees. I joined them to help document the project and at the end of the last day was given the opportunity climb the tallest tree in the grove - a 275ft (84m) tall Sitka spruce. The feeling of hanging in mid-air amongst giants like these is one of humbling awe. Canon 5D MK2 | 24-70 f/4L IS lens | 1/100 sec | f/6.3 | ISO 1600. Waves wash across the ocean and the sky along the west coast of Vancouver Island. The patterns found in nature, from big to small, are something to marvel at. Canon 5D MK2 | 70-200 f/4L IS | 1/2000 sec | f/8 | ISO 400. During a stormy weekend in Port Renfrew this fall, thousands of gulls gathered along the shoreline to avoid the windy weather. Every now and then, something would startle one of them and they would all take off in unison. I loved the way it looked against the green cedars so I hid behind a large piece of driftwood and waited for the moment to happen again. It was hypnotizing to watch but the spell was quickly broken by the sound of a million bird droppings landing all around me. Thankfully, I escaped unscathed. Canon 5D MK2 | 70-200 f/4L IS | 1/800 sec | f/8 | ISO 640. I've waited and dreamt my whole life o a cougar and this year, it finally happened. 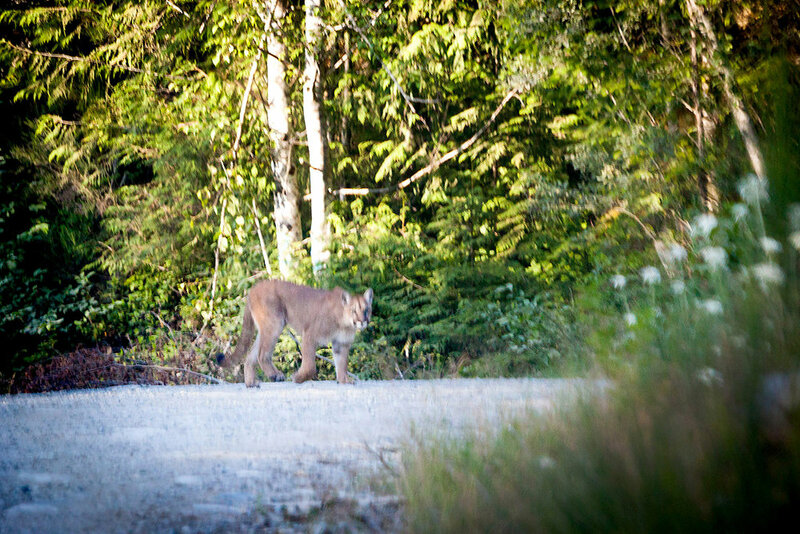 While heading out of the Walbran Valley innot one but two cougars walked in front of our vehicle. After being passed my gear, which was packed away in the back of the van after a long weekend of shooting, I franticly worked to assemble my camera and lens in time to get a shot. In the end, I only had time to get this one image, which was taken through the front window of my van while the cougar stared directly at us. From a photographer's perspective, it would have been nice to get a clearer image, but on a personal level, I'm just extremely grateful to have seen them with my own eyes - a moving experience that I will never forget. Canon 5D MK2 | 70-200 f/4L IS | 1/1000 sec | f/4 | ISO 1600. A male Anna's hummingbird sits perched on the branch of a cedar tree. After closely watching this little guy's patterns early each morning, I noticed he tended to land in a few particular places. So, with the hopes of capturing an image of him in his natural setting, I carefully set up my camera with remote shooting and began to watch the branch for the next 4 hours. Getting the timing and focus just right was extremely tough but after some narrowly missed attempts, it finally worked out! It took a lot of patience and planning to create this image but I'm super happy with it and have a newfound love for this beautiful bird. Canon 5D MK4 | 100mm f/2.8L IS Macro lens | 1/400 sec | f/3.5 | ISO 1600. 2014 was an adventurous year and full of new experiences. From the thousands of images shot, I've tried pick a few favorites and create a personal top 10. Here they are (in no particular order). Hope you enjoy and here's to a fantastic 2015! 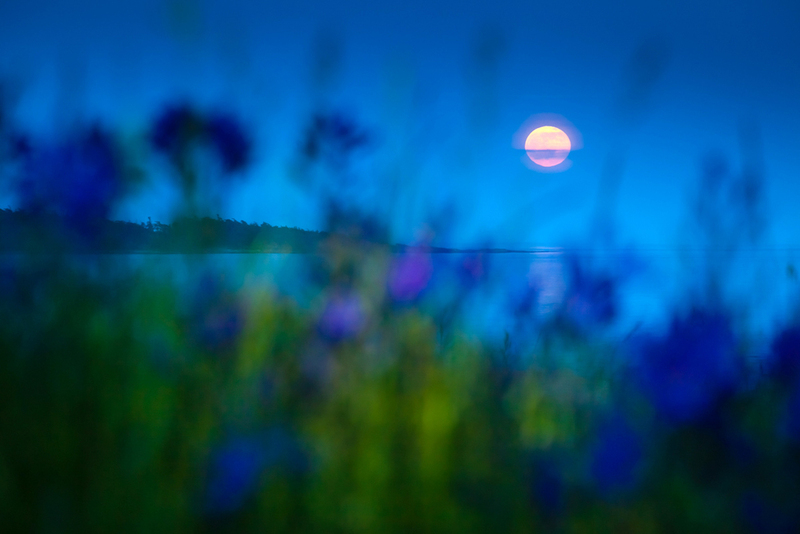 I've always wanted to photograph a full moon rise and this year I finally remembered on the right day. After racing to Cattle Point in Oak Bay, I laid down behind a patch of camas flowers which provided a unique frame and caught it just in time. I'll admit it, I'm a sucker for sunrises and sunsets. It's a great excuse to get out into nature and the colorful display is always something beautiful and different. Here's a classic coastal sunset as seen amongst the idyllic Gulf Islands. Even though I have been to Carmanah Provincial Park many times before, it wasn't until this year that I actually made it to see the famous Three Sisters - a tight cluster of giant Sitka spruce trees with a spot you can sit down in the middle of. This past summer I visited the Canadian Rockies for the first time and was blown away by their raw magnificence. Here, mountains and forest are reflected in the crystal clear waters of a small lake, creating a surreal landscape view. Also from my trip to the Rockies, a golden-mantled ground squirrel curiously approaches during one of our day hikes. Spring in the deciduous forests near Lake Cowichan is breathtaking. After my partner came across this magnificent bigleaf maple tree in the Fall, I was excited to see it bloom. A 15mm fisheye lens allowed me to capture its full glory. One constant throughout the years is the stunning and surprising beauty of nature. Almost like magic, fleeting moments of sheer natural wonder pop in and out of existence, treating one to the most dazzling displays of colour and form. Seen here, rainbow fog beams shine through the old-growth forests of the Upper Walbran Valley early in the morning. Certainly not the most beautiful place I visited in 2014 but definitely the most shocking, this burnt old-growth clearcut in the Klanawa Valley was like a scene from Armageddon. The photos from this expedition provided a stark reminder of the continued gross mismanagement of BC's endangered ancient forests. Each December I visit the Harrison Mills area on the Lower Mainland to photograph the thousands of bald eagles that arrive during the fall salmon runs. This year however, high water levels covered up the dead fish causing the eagle numbers to drastically drop while I was there. Luck did afford me this one close-up view though of an eagle fanning his/her feathers in the warm sunlight. Not only a highlight of my year but a highlight of my life, the climb of Big Lonely Doug - Canada's second largest Douglas-fir tree - is something I will never forget. One of my hopes was to catch a classic side-on view of a climber looking like an ant on the tree - much like the famous National Geographic photos of tiny people dangling in the giant Sequoia. The nearby logging road provided a unique vantage point and helped achieve the perspective. To see the rest of the photos of the climb, please click here.